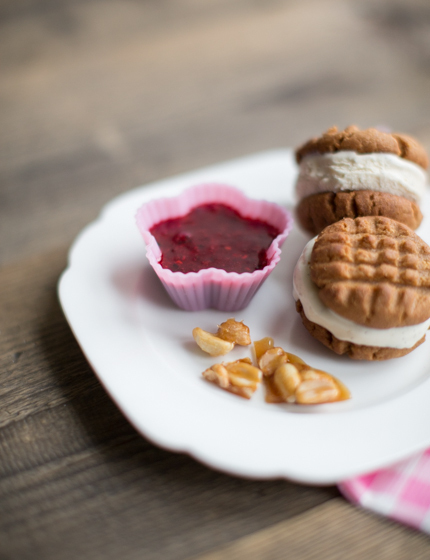 These ice cream sandwiches make a fun dessert or afternoon treat. I love the combination of peanut butter and jelly, and I have a p+j sandwich most mornings for breakfast. 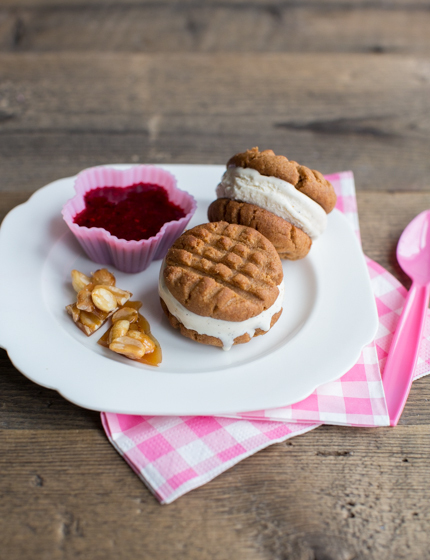 In the US, you frequently see ice cream sandwiches popping up on dessert menus – probably a nostalgic nod to childhood sweets. I think it’s a lovely way to end a meal if you’re still a bit hungry, and they’re also perfect for sharing. You can make flatter and thus thinner cookies if you prefer to get a higher ice cream ratio into your sandwiches, in that case you’ll need to bake them a bit less long. Also, feel free to experiment with ice cream fillings and different cookie types – why not try making them with my chewy chocolate chip cookies next time? 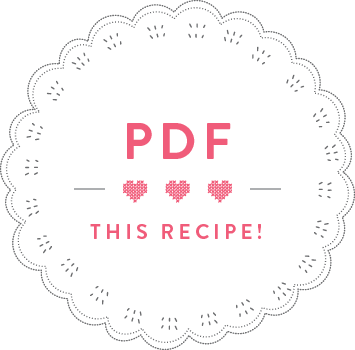 In a mixing bowl, beat the peanut butter, sugar, egg and flour until you get a smooth dough. 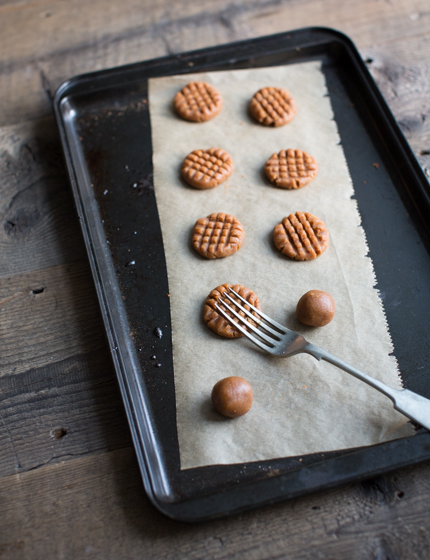 Roll walnut-sized balls of dough between your hands and place on a baking tray lined with baking paper. Press down with a fork on each ball, so that you get a flattened cookie with a nice fork pattern. Transfer the baked cookies on a wire rack and leave to cool. Meanwhile, make the peanut brittle: put the sugar with 1 teaspoon of water into a small frying pan and leave to melt, stirring from time to time. Once the sugar syrup starts bubbling, stop stirring and leave to bubble until the caramel starts turning light golden. Add the peanuts and caramelize until you get a caramel colour to your liking, all the while stirring the peanuts. Pour the peanut brittle onto a piece of baking paper and leave to cool. For the coulis: put the sugar and the Kirsch in a small saucepan and add 1 tablespoon of water. Melt until all the sugar has dissolved. Put the defrosted berries and the sugar syrup into blender and blend into a coulis. If you prefer a smooth coulis, strain it through a fine sieve. 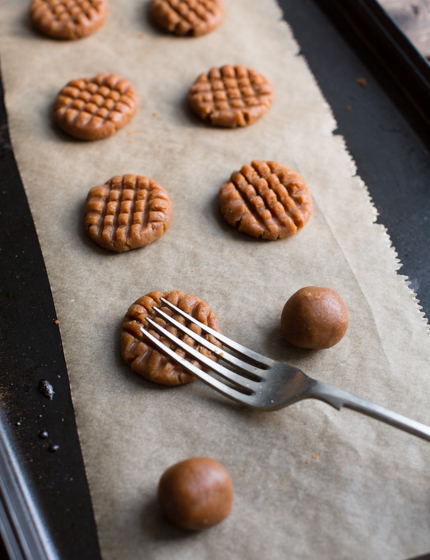 Cut off a slice from the ice cream block and cut out a circle with the help of a cookie cutter (make sure the cookie cutter is not bigger than the actual peanut butter biscuits). 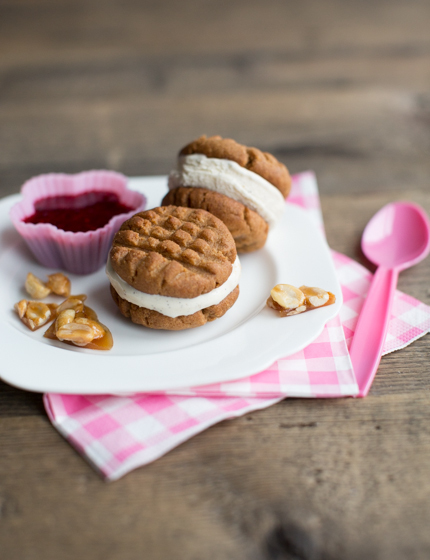 Place the ice cream disk on a cooled peanut butter cookie and top with another cookie. This is best done very quickly, and, if you are doing multiple portions, best is to have someone help so that it goes quicker. Alternatively, you can prepare your peanut butter ice cream sandwiches ahead of time and freeze them for a while before serving. 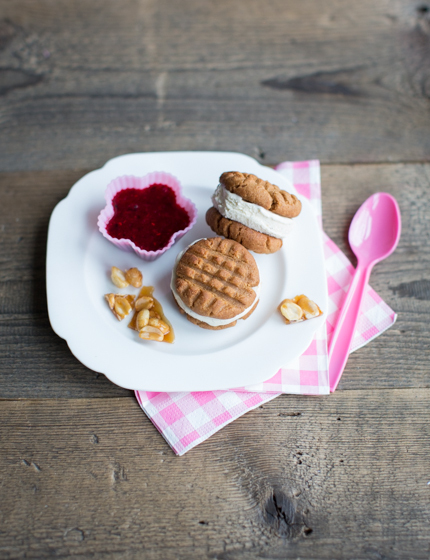 Serve two peanut butter ice cream sandwiches per person, alongside some berry coulis and peanut brittle. 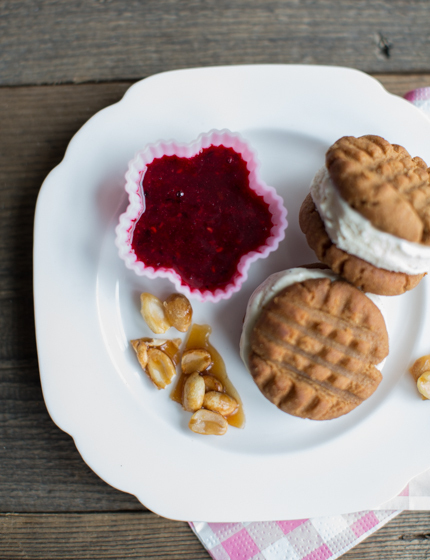 These love peanut butter cookies but never have turned them into ice cream sandwiches before. This is a great idea!